Today's traveller to the northern Highlands will often only see Inverness in passing. 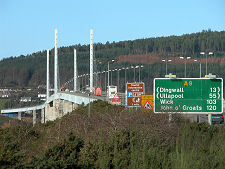 The A9 trunk road carrying traffic from Perth and all points south descends from the summit of Drumossie Muir and sweeps round the eastern side of Inverness. The roundabout close to the stands of Inverness Caledonian Thistle Football Club briefly interrupts progress, but beyond it you cross the Beauly Firth to the Black Isle via the Kessock Bridge. It wasn't always so easy. 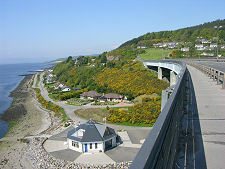 Until 1982, getting from Inverness to North Kessock, now immediately to the west of the northern end of the bridge, required a drive of over 20 miles. The only alternative was the Kessock Ferry which was adequate as an occasional local link, but was not geared up to carry significant amounts of traffic. 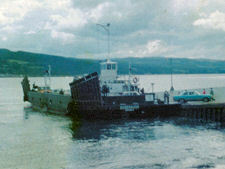 The ferry pictured at North Kessock on the right is the Rosehaugh, which was used on this route until the service closed with the opening of the bridge. It then moved to Corran, and served as the ferry there until 2001. 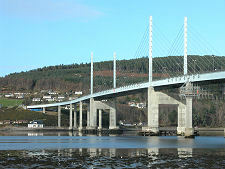 Work started on the Kessock Bridge in 1976, and it opened in 1982. 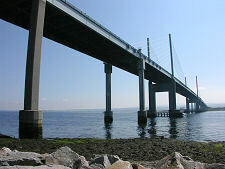 Its total length is 1056m and the central span is 240m long and raised high enough above the Beauly Firth below to allow ships to reach the docks at Inverness. 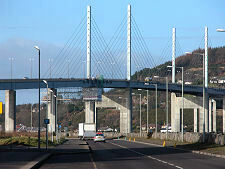 The weight of the central section of the bridge is carried by four towers, from which steel cables stretch down like the strings of a harp to the road deck below. The arrival of the Kessock Bridge had two main effects. One was to place much of the Black Isle within easy commuting and shopping distance of Inverness. This has been one of the factors which has led to the remarkable growth of Scotland's fifth city over the intervening period. The second was to significantly reduce distances and journey times between Inverness (and the rest of Scotland) and the far north. Until the end of the 1970s, anyone travelling from Inverness to Wick followed an A9 which took major excursions inland to get around the western ends of the Beauly Firth via Beauly; the Cromarty Firth via Conon Bridge; and the Dornoch Firth via Bonar Bridge. 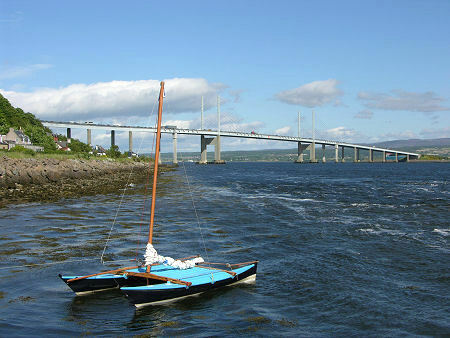 The Kessock Bridge was the most southerly of the "Three Firths" crossings which transformed the situation. 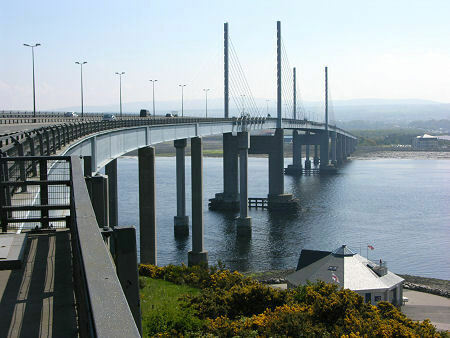 Traffic from Inverness now follows the A9 across the Kessock Bridge, then across the Black Isle before crossing the Cromarty Firth Bridge, and past Invergordon and Tain before crossing the Dornoch Firth Bridge, which was completed in 1991. The result was to reduce the distance between Inverness and Wick from about 135 miles to 104 miles, and reduce journey times even more significantly.